In what has been termed the ‘ mobility turn’ by scholars like John Urry or Tim Cresswell, research has analysed the complexities of economic, social, and political spaces, dealing with both the historical development of movement and mobility and today’s world of social networks, airtravel, multinational corporations, and SMS texting, among others. Contemporary stages have in the last decades addressed this issue of mobility in a multicultural and global world. Playwrights and audiences alike have been fascinated with aspects and processes related to mobility and its many aspects, e.g. ethical issues like hospitality and unequal access to mobility, technological and virtual mobility, migration and displacement, or mobile and immobile bodies on stage. 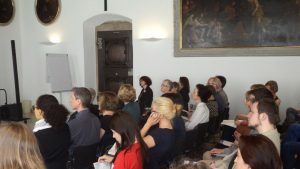 The 25th CDE conference, hosted at the historical Collegium Willibaldinum at Eichstätt, provided a platform to discuss what mobility might mean in the ‘here and now’ of contemporary theatre and drama and how aspects like gender, race, or class might reflect and inflect issues and representations of mobility. The conference started with a welcome address by local organisers Kerstin Schmidt and Nathalie Aghoro and the award ceremony for the CDE Award given to the monograph study Theatre on Terror: Subject Positions at the Home/Front of British Drama by Ariane de Waal. In his laudatory speech, CDE president Eckart Voigts praised the astute and critical analysis of this PhD thesis and its discussion of more than twenty plays’ presentation of the war on terror and presented de Waal with a bouquet of hand-picked flowers. The first day then ended with the first keynote by David Savran (City University of New York) who talked about “Broadway as Global Brand”. He analysed Broadway as a shared vernacular and a success story in terms of finances, images of glamour and a trade mark with a pervasive international influence since WWII. With examples ranging from the historical operetta Im Weißen Rössl and its English-language adaptations to contemporary musicals like the 2015 piece about the founding fathers, Hamilton, with its hip hop soundtrack, Savran focused both on Broadway’s American context as well as on its global movement, specifically in hubs like Germany and South Korea where musicals are hugely successful, creating a flow of musicals and music theatre from and to the USA. 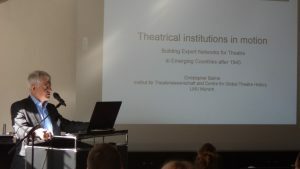 The second day started with Christopher Balme’s keynote on “Theatrical Institutions in Motion” (LMU München). He presented a funded project in which he will focus on the infrastructural side of plays and productions between the 1950s and 1980s and how institutions like the Rockefeller Foundation have, from the 1940s onwards, funded and shaped theatrical movements and institutions in former colonies and developing nations. Balme showed how the funding of infrastructure, e.g. by sending experts and specialists, shapes the way that theatre works, and he problematised concepts like development and modernisation implied by these funding strategies. Theatre and its infrastructure, Balme showed impressively, is not solipsistic but is deeply imbricated in political and social contexts. The first panel of the conference then dealt with technological and virtual mobility. James Reynolds (Kingston University London) focused on the meeting of mobility and subjectivity and the impact of mobility on agency and personal transformation. Using Robert Lepage’s work and its use of technology, including The Far Side of the Moon (2000) and the ensemble pieces of Playing Cards (2012 and 2013), Reynolds showed how Lepage creates an uncanny theatricality which turns theatre into a non-place with a blurred border between stage and off-stage. Christine Schwanecke (Universität Mannheim) then thematised the types of mobility offered to recipients as participants in Rimini Protokoll’s Situation Rooms (2013) and the role of digital technology. The piece, she argued, moved theatre out of the black box with no distinction between stage and audience, but it also literally moved across countries and is available in different languages. In its content, finally, the performance also deals with life stories connected to mobility and war, thus putting aspects of mobility centre stage. The final paper of the panel by Nassim Balestrini (Universität Graz) then used Stephen Greenblatt’s notion of cultural mobility to discuss ecological theatre and how it has attempted to represent issues of climate change. Focussing on Chantal Bilodeau’s Arctic-cycle of eight plays (2014-ongoing), Balestrini showed how Bilodeau translates climate change as slow violence via the cycle’s seriality, juxtaposing humans, animals and non-humans as well as cultures, languages and competing interests. The third keynote by Fiona Wilkie (University of Roehampton) concentrated on the politics of representing travel and motion. Taking her route from historical ‘voyage drama’ with its tradition since Shakespeare, Wilkie asked how a performance itself moves, how it shapes our expectations of motion and how figures like the flaneur, the traveler, or the refugee are represented on stage. Her examples included Graeme Miller’s Beheld (2006) and Jet Lag (2010), David Hare’s Behind the Beautiful Forevers (2014) and Via Dolorosa (1998), Laurie Anderson’s Slideshow (2016), which premiered at the Brighton Festival, and The Encounter by Simon Burney (2015), a story about a voyage to the Amazon which questions the ‘badge of integrity’ that comes with a traveler’s story and its claim of representing real events. The second panel of the conference concentrated on migration, displacement, and the limits of mobility and opened with Dilek Inan’s paper on “Geopathic Disorders in David Greig’s Europe” (Balikesir University). Using Una Chaudhuri’s concept of ‘geopathology’, Inan focused on the suffering created by one’s location and the sense of displacement and vulnerability that can happen to both those who leave home and those who stay at home. Greig’s 1996 play showed a new xenophobic Europe where survival and travel are confronted with new nationalisms, but where travel is also an opportunity to change your life chances. Trish Reid (Kingston University London) then revisited a decade of the National Theatre of Scotland and the practice of the NTS to produce works in diverse settings all over Scotland. Discussing the Ignition-Project that was performed in as far-away places as the Shetland islands or the site-specific Home-Project, Reid talked about the key idea of the NTS to produce an ‘engaged’ and itinerant performance practice as part of the agenda to create a new national but intensely decentred theatre. 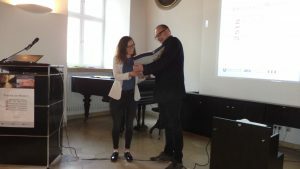 Ilka Saal’s presentation then tackled issues of race in American culture by reflecting on recent proclamations of a color-blind society and the appropriation of forms of black cultural expression in mainstream culture (Universität Erfurt). She used Young Jean Lee’s The Shipment (2009) to discuss this increasing portability of definitions of blackness and race, stating that through Lee’s provocative use of stereotypes and satire, she challenges the traditional boundaries of theater, asking who gets to define blackness and on whose terms. The second day of the conference ended with a trip to the Kammerspiele in Munich and its performance of 50 Grades of Shame by She She Pop, a wild mixture of Frank Wedekind’s Frühlingserwachen and E.L. James’ bestselling novel. The ensemble used screens and virtual technology to project and reassemble their bodies which resulted in a performative investigation of layers of mobility in theatrical practice. After the performance, the conference participants met members of the theatre collective for an open discussion. Saturday started off with a keynote by Tadashi Uchino (The University of Tokyo) on “Mobility and Residency”, fittingly given via Skype. Using the notion of ‘residency’ as a starting point, Uchino talked about the mobile artist and her/his work, but also the fixed location and institutional body that frames the artist’s work. His example, the Tokyo-based Dance Archive Box Project (2013 and ongoing) attempts to make it possible for a work like a dance performance to travel and be taken up by different artists in different times and spaces, creating a box with props and instructions. In this, Uchino argued, a moment is archived but also mobile and changeable, making it possible to actuate the body, movement, and the framing infrastructure of someone left behind. The third panel of the conference was interested in the ethical considerations of mobility and started off with Vicky Angelaki (University of Birmingham) and her paper on “New Writing and the Ethics of mobility”. Using Simon Stephen’s work as her primary example, Angelaki looked at both how mobility is a topic in Stephen’s plays and how his work has been adopted and promoted by European theatres. Elective mobility and access to travel turns into a compulsion and a sense of loss in Stephen’s pieces, shedding light on the overall positive evaluation of mobility in today’s world. Martin Riedelsheimer and Korbinian Stöckl (Universität Augsburg) added to this concern with globalisation and movement in their discussion of debbie tucker green’s theatre. They interpreted green’s work as cosmopolitan plays dealing with grief and mutual responsibility in a shrinking world that has increasingly turned into a shared social space. At the heart of green’s plays, they claimed, is an appeal to a new ethics in a world of strangers who have to accept their responsibility for each other. The panel’s final paper by Julia Boll (Universität Konstanz) interpreted The Host and the Guest by Synetic Theatre (2002), based on Vazha-Pshavela’s narrative poem of the same name. Applying Butler’s notion of ‘ungrievable life’, Agamben’s homo sacer and Bauman’s ‘wasted life’, Boll analysed the play’s investigation of hospitality and reciprocity. In its depiction of a community’s struggle with armed conflict and its own rules of hospitality, the play shows how grief is not private but rather a political and ethical responsibility for everyone. 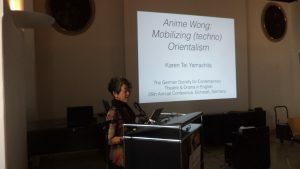 The conference’s first artistic keynote was given by Karen Tei Yamashita (University of California, Santa Cruz) and began with a consideration of Orientalist images in Shanghai Express (1932) and its depiction of rebellious femininity in Marlene Dietrich and Anime Wong. Framed by Said’s ideas about Orientalism and extending it to Asia and South-East Asia, Yamashita discussed the long history of American fascinations with Asia and how it has recently combined with ideas of the post-human, resulting in the notion of techno-Orientalism. In her own work, she claimed, she has worked with these ideas of the post-human and American fears and fascinations to discuss how mobility is both migration and trauma for the Asian-American community and how notions of race and ethnicity play into these experiences. She then presented examples from her own work with community theatre and showed images from productions like Noh Bozos or Hannah Kusoh. Right after the keynote, Karen Tei Yamashita engaged in a conversation with Lucy Mae San Pablo Burns (University of California, Los Angeles). They talked about the circulation of images of Asian characters in popular global and American culture and how these images are received in the Asian-American community. Dwelling on the role of genre, the influence of manga and anime, the role of collaborations with local community theatres, or the changing ways in which Asian Americans have thought about theatre, the conversation highlighted interesting aspects of contemporary theatre practice in Asian-American communities in the USA. The day ended with a performance of Reginald Rose’s Twelve Angry Men by students of the Catholic University of Eichstätt-Ingolstadt and a reception celebrating CDE’s 25th anniversary. In their speeches, president Eckart Voigts and former CDE president and founding member Wolfgang Lippke looked back onto CDE’s past and toasted to the society’s future. The final day of the conference kicked off with a drama and dance workshop with David Williams who focused on the body and its movement. The second artistic keynote by Lucy Mae San Pablo Burns (University of California, Los Angeles) then looked at “Scenes of Migration” and focused on her dramaturgical work. She stressed that in her work concerned with American Filipinos the figure of the migrant is not a celebration of a nomadic life or a trope of resistance but rather an ambivalent paradigm of the crisis of dislocation and an alternative connection to a new community. Reading from the script of R.Z. Linmark’s But, Beautiful and discussing the text’s 2013 production by Te-A-da Productions, Burns investigated the notion of flexible labour and issues of gender. The conference then ended with the fourth and final panel of three papers focusing on im/mobile bodies and the stage. Leopold Lippert (Universität Salzburg) presented a paper on the monumental ten-episode performance cycle Life and Times by Nature Theater of Oklahoma (2009) and his own experience with the hours-long experience and exhaustion caused by the performance. He argued that the ideas of exhaustion, overwhelming multi-tasking and overtime in the cycle are a comment on the ways in which people and their bodies are used by neoliberal capitalism. René Schallegger (Universität Klagenfurt) then moved into the area of disability studies with his paper on two plays about disability, Kevin Kerr’s Skydive (2007) and Brad Fraser’s Kill Me Now (2013). While Kerr presented disability theatre, i.e. disability functioning not as a topic but rather as a landscape with a contraption to make an actor and his wheelchair fly, Fraser had created a theatre about disability, Schallegger argued. As a result, both plays engaged audiences in very different ways. The final paper by Merle Tönnies (Universität Paderborn) then focused on the immobility of power in British political theatre after 2000. Using the notion of ‘absurdist dystopia’, Tönnies detected a resurgence of political issues on British stages, but more as an allusion or background instead of a direct issue in the plays themselves. In her examples The Cut by Mark Ravenhill (2006) and Edward Bond’s Have I None (2000) she showed how in plays like these, the audience remains as immobile as the depicted power systems. All in all, the 25th annual conference of the German Society for Contemporary Theatre and Drama in English demonstrated how lively and interdisciplinary debates about theatre and mobility currently are, and it created a productive platform for an exchange between performers, scholars and students alike.